Gilbert Stephens Solicitors are proud to be sponsoring the Friends of Ottery St Mary Parish Church for another year. We have been actively involved in supporting the efforts of the Friends of Ottery St Mary Parish Church for many years now, getting involved in their Christmas Tree Festival, Christmas Market, Flower Festival and attending other events throughout the year. Last Christmas we made our mark in the historical 14th Century church by decorating our very own Gilbert Stephens Tree, which was put on display for a week in December with around 50 other trees decorated by local community groups, businesses and organisations. Each year, the Friends of the church work hard to organise events that have become renowned in the local area, with visitors coming from far and wide to spectate and participate; at these events there are seasonal refreshments and plenty of stories about the church and local area on hand. The Friends of Ottery St Mary Parish Church were established in 1952 and became a registered charity in 2001. With the Lord Bishop of Exeter as their patron, the Friends of the church are going from strength to strength with their fundraising efforts, contributing to the upkeep of the church on a yearly basis as well as instigating and supporting bigger projects for the church and its parishioners and visitors. The Church has a rich history, being re-built in the image of Exeter Cathedral in 1342 on the site of an older, 13th Century church. It boasts in its long story the birth of Samuel Taylor Coleridge, famous writer and philosopher, in the old School House opposite the church steps. 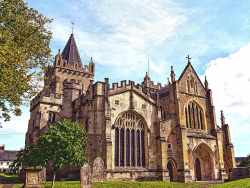 To find out more about what’s on at Ottery St Mary Parish Church, take a look at their website or Facebook page @otterystmarychurch.